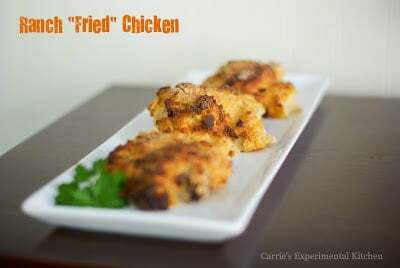 Saturday, July 6th was National Fried Chicken Day and though is not something we eat regularly in our home, every now and then the kids ask for it. I had some chicken thighs and found a package of Hidden Valley Ranch Dressing Mix and made this simple breading to coat the chicken with. I have to say the chicken was really tasty and crispy and everyone loved it. I probably could have shaved off some extra calories and fat by removing the skin, but opted to leave it on for this recipe. If you’re looking for a great side to go with it, these Corn and Cheddar Mashed Potato Fritters would be perfect! Rinse chicken under cool water; then pat dry. Add the buttermilk and chicken to a resealable plastic bag and refrigerate for 8 hours or overnight. Combine the flour, baking powder, paprika and Hidden Valley Ranch Dressing Mix in a bowl. Remove the chicken one at a time allowing for the excess buttermilk to drain off; then dip it into the flour mixture and place on a baking sheet with a wire rack. Do this for all pieces of chicken. Spray the top of the chicken with the cooking spray and bake for 40-45 minutes or until the chicken is cooked through and juices run clear. This looks yummy! My son is learning to grill this summer, but when we head back inside, this will go on the list.